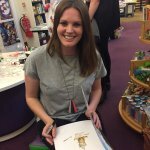 We were thrilled to welcome Lucy Rowland to Picture Book Club on 13th June 2017. This is Lucy’s debut year as a picture book author and it was fascinating to hear the story of her journey to publishing success. Lucy doesn’t come from the world of publishing or advertising (she’s a speech and language therapist) and so she feels like ‘one of us’. In an accomplished engaging talk, it was fascinating to hear how Lucy’s love of poetry and rhythm goes back to her childhood. 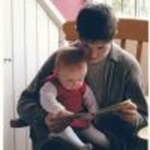 She shares a love of the rhythms of AA Milne with Nicolette Jones; a previous PBC speaker. Lucy shared the story of how she was signed by her agent, Anne Clark, while in Bali on a 10 month sabbatical in Bali. We have all decided that we need one of those! We also now know the secret of where her profile pic was taken and we learned what a gecko sounds like! Often ideas for Lucy’s stories have come from the world around her on the travels that feed her soul although she has also written some, like The Birthday Invitation, on the bus to work in Lewisham. Slightly less glamorous than Bali perhaps but it just shows that inspiration can strike anywhere. Sometimes it starts with a title and sometimes with inspiration for a text rhythm. Wherever the ideas come from, Lucy is obviously doing something right because, by the end of 2018, she will have 11 books in print. Not bad for a newbie! 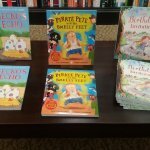 If the Picture Book Club sales of The Birthday Invitation, Pirate Pete and his Smelly Feet and Gecko’s Echo were anything to go by, we will be hearing a lot more of Lucy Rowland in 2017 and beyond! Thank you so much to the marvellous team at Broad Street Books in Reading for being such gracious hosts once again.